Look your vibrant best on these nine days of Navratri with Bharatsthali. The Navratri are the days of colour, hope, belief and celebrating womanhood. We at Bharatsthali believe in making the best of it. Here is this special Navratri edit for you ladies to twin up with the vibes and aura of the goddess! A saree that brings out the best in you without overwhelming you! It is the day-one of the Navratri when you will be busy with the ‘Kalash’ and ‘puja’, hence this non-intruder! This pure linen saree is so soft and airy that it lets your skin breathe. Perfect for occasions when constructive chaos is going to rule the day. While the hustle-bustle has settled in, the vibrancy and the feel of spirituality hasn’t. The days start with the temple bells and ends on the notes of chants. Shouldn’t there be something more to reflect this inner bliss too? This pure Kanjivaram saree is the result of efforts and perseverance. The weavers and artists in the far-flung villages of South India have spun this fairy tale of a saree for you. When you wear this saree, you don’t drape just the nine yards of fabric but the warmth of perfection and sophistication. Let the blessings manifold and your heart dance with joy! Sway to the rhythm of garbas and dandias in this beautiful south cotton saree. Easy on the skin and classy in feel, this saree doesn’t let you feel the burden or come in the way of your leisure. Beautiful and charming-should be the style statement for the day! Epitomising the sophistication and happiness, this saree is the mere reflection of the joy and blessings you are feeling on the inside. The fasting makes you stronger, clears your toxic thoughts and brings you lot closer in terms of spirituality. Here’s to all the divas that enlighten us and make us get through the day! A pure linen saree with the artsy touch of ikkat! Simply irresistible! Maa Katyayani is worshipped on this day. She removes obstacles and impediments in one’s marriage and personal life. What colour can be better than the bright and intense shades of red? This south silk handloom saree makes you feel closer to your personal evolution externally and internally. Busy, busy and busy is the mantra. A lot needs to be done such as the preparation of ‘prasad’ and gifts for young ‘kanyas.’ Why not dress for it? Sun-kissed hues to make your day brighter and a lot more beautiful! 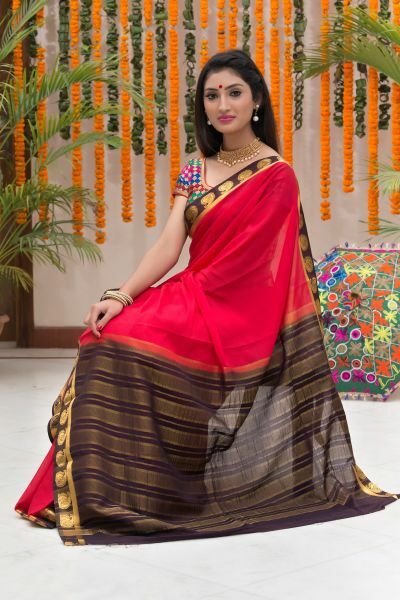 An art silk saree with zari pallu and motifs! The luxe celebrations deserve the best of brilliance! Match the madness and rush of ‘kadhai’ with your best stylish avatar. This is the day of emerging victorious and invincible in the battle with demons. The celebrations on this day should be grand and bigger than ever. Lo and behold! This Dharmavaram saree is for you to celebrate and enjoy the day of the big victory. The beautiful and intense scheme of colours is a symbolic interpretation of your inner peace and joy. We celebrate the birthday of Lord Rama on this day.. Many people break their fast on this day. Even if they not, it is a day of celebrations anyway. Feasting in style should be the mantra of the day, we say! This beautiful south silk saree is just the way to greet people while feasting on the offerings. Let your traditions come alive, this Navratri. Feel the spiritually and a lot closer to your roots in traditional Indian wear sarees that are crafted for your special occasions exclusively.